Over the last few weeks I have watched history being washed away from the street in which I live. This may seem a strange thing to say when the result is a suberbly renovated ancient building, but the peeling away of layers of grime has also peeled away a layer of time. The walls of this structure are now magnolia white, but two timeworn handpainted advertising panels have disappeared forever. The generally accepted term for these traces of promotional history is ghost signs. There are comparatively few around Paris, very largely for the reasons shown here. 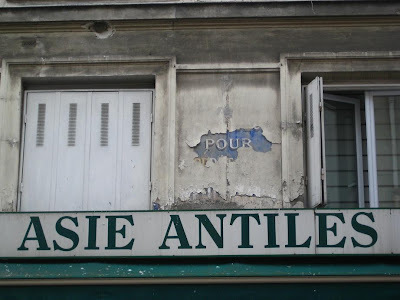 Enviromental regulations in Paris demand that homeowners sandblast the façades of their buildings on a regular basis (approximately every 20 years), and most painted elements have long since been removed. Paris is very much a stone city too, whereas many examples of surviving ghost signs around the world were painted on brick (indeed, another term for them is brickads). This example in my street was therefore something of a rarity in Paris, making it even sadder when I saw it washed away forever. 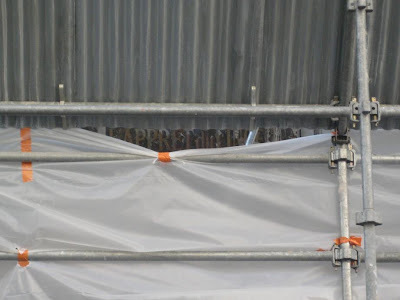 I wanted to tell the workers to do all they could to protect this piece of history, but I cannot blame them for doing their work nor the building owners who wanted a spotless façade after years of living in a decrepid, peeling structure. The building dates perhaps from the 18th century and is an admirable piece of living history itself, so did it need this somewhat gaudy commercial trace? Why did I want to see this slogan cleaned up and preserved when many today are already protesting against the proliferation of advertising in public places? Firstly I was curious to see what the ad actually said. 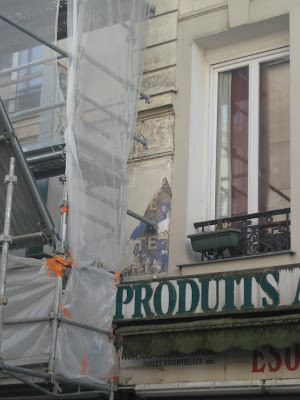 Although I only ever caught glimpses, I saw enough to discover that it was for a soap product that was used on clothes before the main wash (you may just make out "l'apprêt du linge" above). Secondly, it was the way the text had crept out from a previous covering of paint, and seemingly in immaculate condition. It was like seeing a viking longship appear on a beach after a heavy storm, and I was hoping that archeologists would appear with their delicate hands and gentle brushes and dig this relic out too. It's as if a giant eraser came down and had its way. "Ghost signs" -- how perfect. Building surfaces can be such beautiful palimpsests .... there are wood telephone poles here in Ann Arbor that wear the most amazing thick "pelt" of rusty staples, the only trace left of countless posters and flyers affixed to their faces. Yes it's all over the world that they are disappearing. Arizona was too poor to afford bricks' walls at the time that's why these ghost signs are on wood. It's a little late in the day, but just read your post and remembered ghosted signage we photographed when we were in Paris in April. 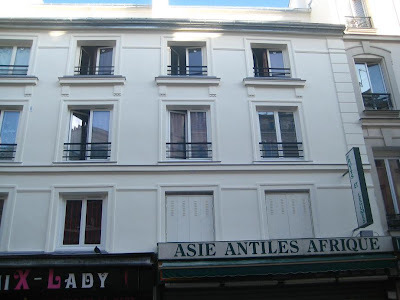 The lettering is on a building at 15, rue de Thorigny, and the disappearing copy reads: Soldes Textiles with the address. Will try to provide the link to our post which included a photo of the facade, but in case it doesn't work, we posted on May 14,2009 with the title "Peek A Views"
I agree, it's a pity, but perhaps unavoidable. I think it's striking when you see some 100 years old pictures, to which extent the walls were covered with publicity... although there was no JC Decaux around! What, am I to understand that there's no Musée des Billboards in Paris? Sad to see this disappear, but thank you for explaining why this happens in Paris. I always found it surprising that these signs are so scarce there, compared with other French towns. Je suis également sensible à l'évolution de la ville qui peut rester telle quelle très longtemps et bouger radicalement soudainement sous une impulsion rénovatrice. Près de chez moi un magnifique local à poubelles qui avait brulé (ce qui le rendait encore plus beau) a été rasé, je m'en suis aperçu vendredi dernier. I am always on the look-out for old signage wherever I go just for the reason that it will all soon disappear forever under fresh paint or eroded off by the elements or demolition...and sometimes the partial signs and words remaining can be even more so mysteriously evocative! 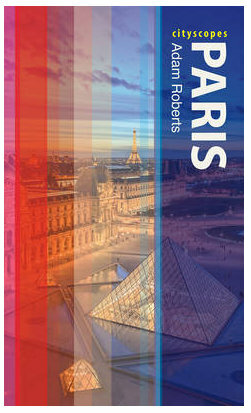 Yes, sometimes I have had the same feeling and not only about Paris but also in Rome or Venice or Berlin. I have a friend that is leaving in Montmartre and is doing everything she can to bring back the history of this little village, once home for people like Monet, Picasso and many others. Enrica: Thanks for the link. That's a great story - maybe I'll go and talk to the bookshop owner sometime.